I needed stamps. I don't write nearly the number of letters I used to, but there comes a time when you just need stamps. When I went to get some, they had the first of their Christmas issue out. Woohoo! "A Charlie Brown Christmas" immortalized in stamps. 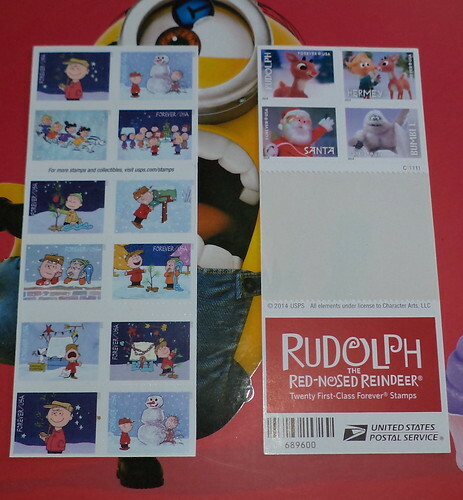 Last year, "Rudolph, the Red-Nosed Reindeer" was on stamps. It was just a 4-pane, repeated, so I could use up all except one pane. I've been meaning to frame these. It appears Charlie Brown is 10 different stamps. I'll save one section and use the rest. Then, I really should look at framing these or, at the very least, putting them somewhere other than the sleeve I have for stamps and return address envelopes. At one point, I was going to get cat Christmas cards which I saw in one of the catalogues showing up now. But then I realized, I am going to a couple places where the opportunities for photos are great. It costs more, but this year, I'm sending photo cards. I should go buy more Charlie Brown stamps to make sure I have enough. I also discovered I don't own a copy of "A Charlie Brown Christmas". I'm not sure how that happened but, thanks to needing a smaller purse for BlizzCon, I ordered the Blu-Ray disc from Target. "It's the Great Pumpkin, Charlie Brown" is also not in my collection. One movie at a time.